The Taranaki Classical Guitar Summer School (TCGSS) has received a $10 thousand grant from the TSB Community Trust to bring internationally renowned classical guitar artists to Taranaki and New Zealand. 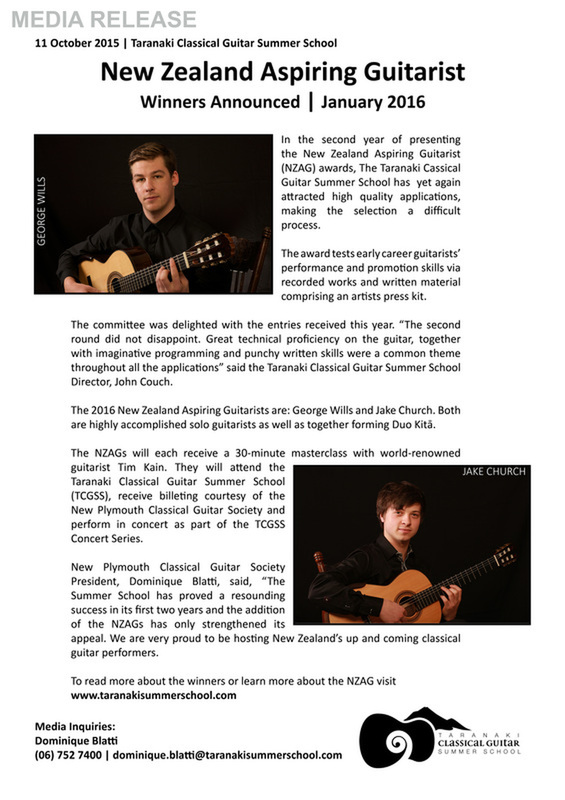 TCGSS Director John Couch, MMus, and his team, received the funding to facilitate the running of the second Taranaki Classical Guitar Summer School (TCGSS). Funding for the project comes from the community Fund’s Annual Grants Program, which is designed to support creative projects and organisations that aim to foster access to, engagement with and experience in arts and culture and that facilitate improved educational outcomes for people in the Taranaki area, including innovative projects and lifelong learning. Currently classical guitar summer schools do not exist anywhere else in the country, and the 2012 summer school was the first one in approximately 20 years. The summer schools were very popular in the 1970’s and 1980’s but stopped in the early 1990’s with the collapse of the New Zealand Guitar Federation; an organisation that looked to unite classical guitarists and societies on the national level. This has led to a need for a uniting force in classical guitar in New Zealand. Community access to classical guitar concerts in New Zealand is increasing rapidly, thanks to the hard work of local guitar societies and the New Zealand School of Music. Access to international and national guitarists of award winning standing requires investment and time. “Attracting these guitarists will be a large-scale effort, requiring collaboration across all the guitar societies in New Zealand,” Couch says. As a first step to creating this national vision, Couch and his collaborators have established the TCGSS. 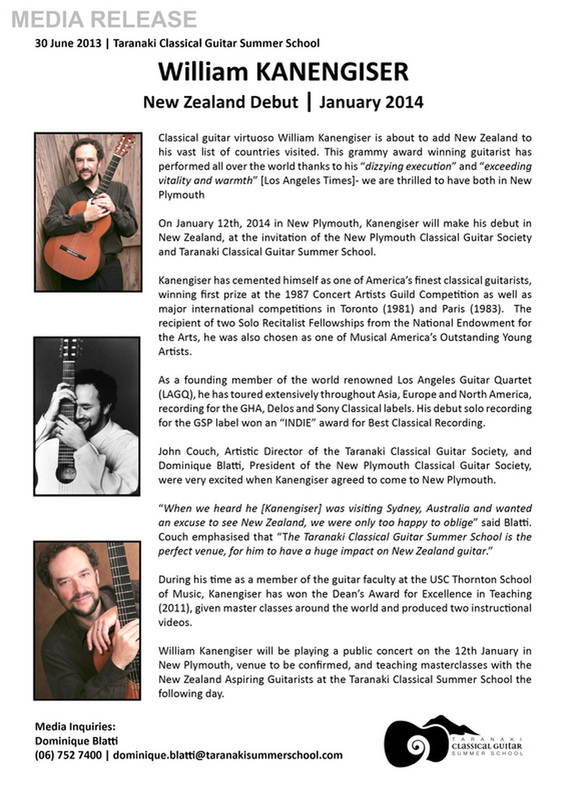 In 2012 Couch and the New Plymouth Classical Guitar Society ran the first TCGSS, to resounding reviews and a turn out of 70 participants. The team will again run the summer school 13-18 January 2014 in Taranaki including artists from Australia and North America. The TCGSS will also create paid performances for two tertiary music students with the newly created New Zealand Aspiring Guitarist (NZAG). For more information on TSB Community Trust click here, including information on grants available and recent awardees. For the first time ever, not one but two classical guitars have been selected for the Muriel May competition! Five contestants all under 21 years of age will play classical or jazz instrumental pieces of about 15 minutes each before a live audience in an attempt to win a scholarship of $10,000.00. This year includes Jake Church and Dylan Solomon, two superb guitarists in the line up along with Simon Mace (pipe organ), Breanna Morgan (piano) and Alex Geary (violin). Jake Church graced the summer school in 2012 with an outstanding lunchtime concert. Born in Grimsby, North East Lincolnshire, England, his family moved to New Plymouth, New Zealand in 1997. His parents bought him his first guitar when he was 7 years old and began learning from his father and primary school Headmaster. At the age of 12 he started learning the classical guitar, under Ross Townsend. As well as bass guitar and went on to explore the realm of jazz at 14 years old. This versatility has allowed him to be involved with many different areas of music and has kept an open mind for any opportunity that presents itself. He has finished his 1st year at the New Zealand School of Music, where he has been under the tuition of Dr Jane Curry, and has been appointed as the leader of the NZSM Second Year Guitar Quartet for next year. In 2011 He was in the 1st place Jazz combo, Me Llamo Esteban that won the NZSM Secondary School Jazz Competition in Wellington and opened for Shihad with his Rock band, which also won the Regional Rock Quest competition. Jake’s classical guitar has been the basis of his dedication and aspiration to pursue a career as a professional musician. Dylan Solomon attended the inaugural Taranaki Classical Guitar Summer School in 2012 taking a master class with Dr Jane Curry. Dylan has been playing classical guitar under the watchful eye of Ross Townsend for four years. Despite his brief time with the instrument, he has passed grade 8 classical guitar and grade 6 music theory with distinction through Trinity Guildhall College and has been accepted into the classical guitar program in the New Zealand School of Music. Dylan has also taken part in many masterclasses with world renowned guitarists including Dr. Jane Curry, Uli Jon Roth and Alieksey Vianna. After finishing his degree Dylan looks forward to travelling around the world with his guitar before settling down and becoming a secondary school music teacher. Each contestant will perform a 15 minute programme at New Plymouth's Theatre Royal on 17 December 2012 in front of adjudicator Richard Mapp, of Wellington. Tickets are available through ticketmaster. On 16 January 2012 over seventy classical guitar players converged on the Highlands Intermediate School in New Plymouth. Professional guitar teachers and musicians, as well as amateur enthusiasts flew in from as far afield as South America. From 9 am Monday morning until 10 o’clock Saturday night; fingers flew, brains buzzed and memories did overtime to polish pieces that ensembles and the orchestra had to learn and perform by the end of six days. In one week a concert of international standard was put together under the keen direction of Australian-based Kiwi guitarist John Couch. The school brought to New Plymouth an impressive lineup of concerts, featuring some of the worlds leading guitarists from New Zealand and Australia. Tears were brought to the eyes of concertgoers when John Couch and Prof. Matthew Marshall (Dean, School of Creative and Performing Arts, Central Queensland University) performed ‘Ask Me Tomorrow’, a piece written to celebrate a life battling cancer. Hushing an audience with his self-composed ’37 Nights in Scotsmans Valley’, Kotaro Nishishita proved to be an up and coming guitarist not to miss. In addition to public concerts, students were treated to a range of diverse topics from flamenco techniques for classical players, to conquering stage fright. The school also promoted luthiers (local and international), running a workshop on the design and construction of guitars by Auckland-based luthier, Rod Capper. The workshops were well received with participants finding presenters “excellent” and the workshops “professionally run”. Owen Moriarty, Jane Curry and John Couch promoted their homegrown talent through the direction of ensembles. “Great leader”, “highly commended” and “interesting and inspirational” were just some of the praise these ensemble directors received for their hard work. Included for participants, was the possibility to approach these three leading guitarists, as well as all masterclass and workshop presenters for private tuition. This opportunity was taken up my many of the students attending the summer school. Notable for their range in age (10 – 83), students held high expectations for this, the first guitar summer school held in New Zealand for 20 years. Some were starting out on careers in music performance, whilst others were professionals in medicine, architecture and engineering. A founding member of the New Zealand Federation of Guitarists, John Turner privileged the school by attending as a student. There are an increasing number of young musicians taking up careers in classical guitar and Prof. Matthew Marshall stressed the need for players of the instrument to both compose and commission works for the guitar. In his concert performance he played the winning three compositions from the recent 2011 Classical Guitar Composition Competition designed to promote New Zealand professional guitar. The week culminated in an opportunity for the school to give back to the community that has hosted it in a performance on the Hatchery Lawn at the Pukekura Park Festival of Lights. Over seventy guitarists were pictured on the front page of the Taranaki Daily News performing to a crowd that exceeded the expectations of the Festival of Lights organisers. 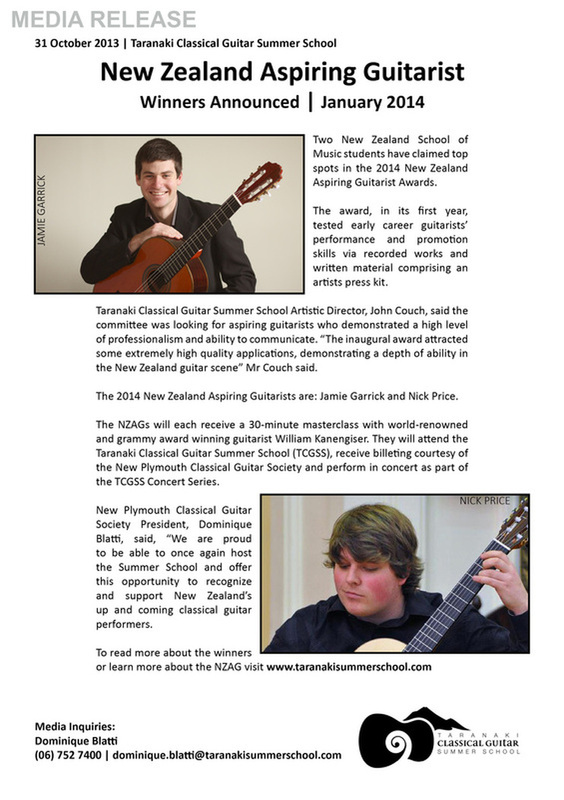 The inaugural Taranaki Classical Guitar Summer School was so well received that enquiries have already been made into the 2014 school from both students and overseas talent wishing to perform and teach. This event made clear that classical guitar is an instrument of unparalleled musical versatility, and one with a unique capacity to capture the mood of the New Zealand landscape just as it has captured for centuries the sounds of Spain.